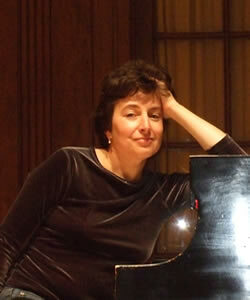 Svetlana Krasnova received her Master’s degree in Piano Performance and D.M.A. degree in collaborative piano from the Gnesin Academy of Music (Moscow, Russia). Ms. Krasnova has performed as a soloist and chamber musician in Russia, Italy , Canada and United States. While living in New York, Ms. Krasnova appeared in Carnegie Hall’s Weill Recital Hall , and she was active as a collaborative pianist in Mannes College of Music and Manhattan School of Music. She participated as a collaborative artist in a number of music festivals including Weathershield Music Festival (Vermont) and Rome Opera Festival (Italy). As a member of a piano trio, Mrs. Krasnova performed in Ottawa (Canada). She performed as a guest artist in chamber music recitals at Kansas University at Lawrence, Minnesota School of Music, Roosevelt University, Chopin Festival (Chicago), De Paul University and Curtis Institute of Music. Currently, Mrs.Krasnova teaches at the College of Du Page, while performing various recitals in the Chicago area.